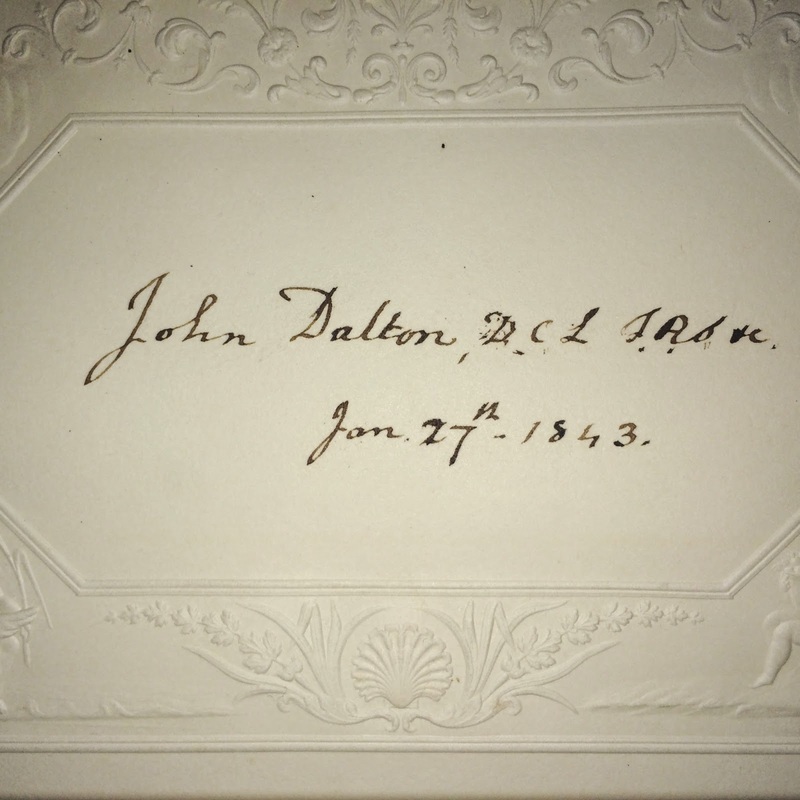 John Dalton’s autograph appears to be authentic for sure, but who drew that pencil sketch? I recently acquired two pages of an old autograph album, one of which is signed by the famous scientist. Dalton wrote his name in the panel above the sketch, which depicts a rather palatial structure (Figures 1-4, click on each image to enlarge). Figure 2. 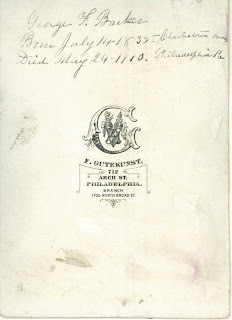 Page with Dalton's signature and sketch. Figure 4. Pencil sketch of unknown building. The album reportedly belonged to a Gillian Shaw and his family from Leamington Spa. On the page facing the one in question, Peter Clare, Dalton’s good friend, and Dr. Byrom, presumably of the well-known Manchester family, signed their names as well (Figures 5 and 6). 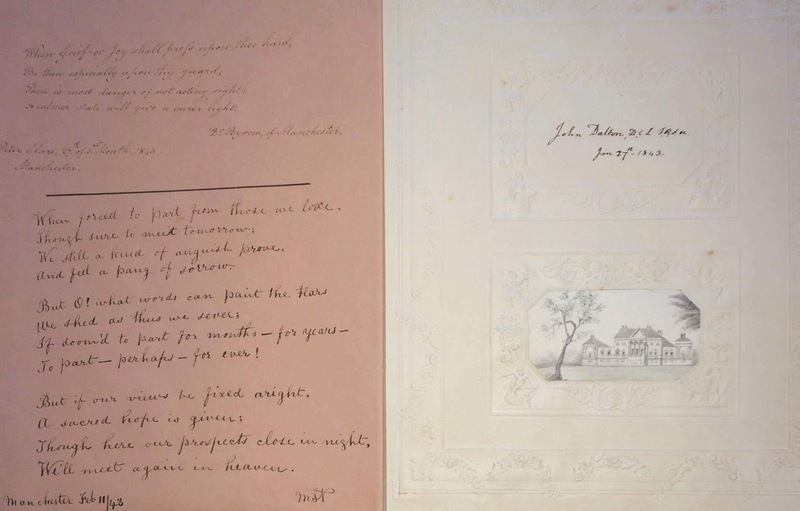 The Dalton, Clare and Byrom autographs are all dated 27 January 1843, suggesting that the owner of the album was visiting Manchester, perhaps a friend or acquaintance of one of the signatories, or even a former student of the famous scientist. Figure 5. 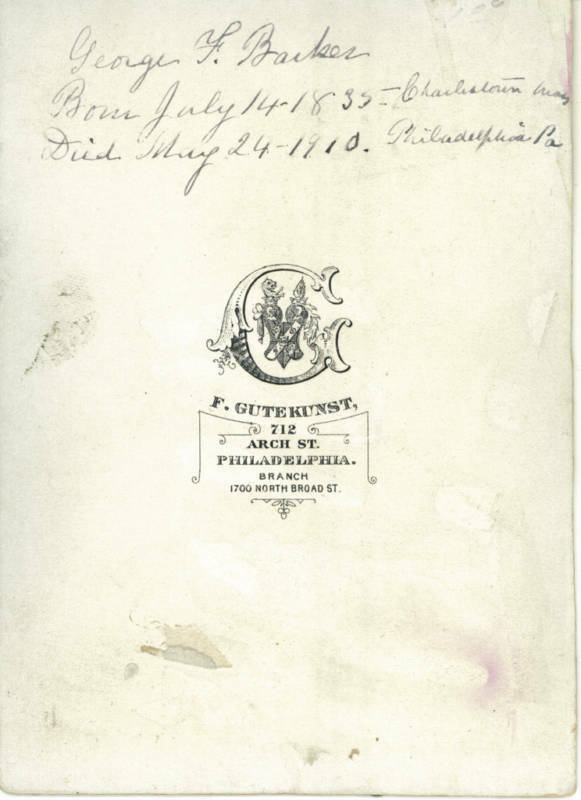 Album page with Clare, Byrom, and MST autographs. Figure 6. Clare and Byrom autographs. Questions abound. 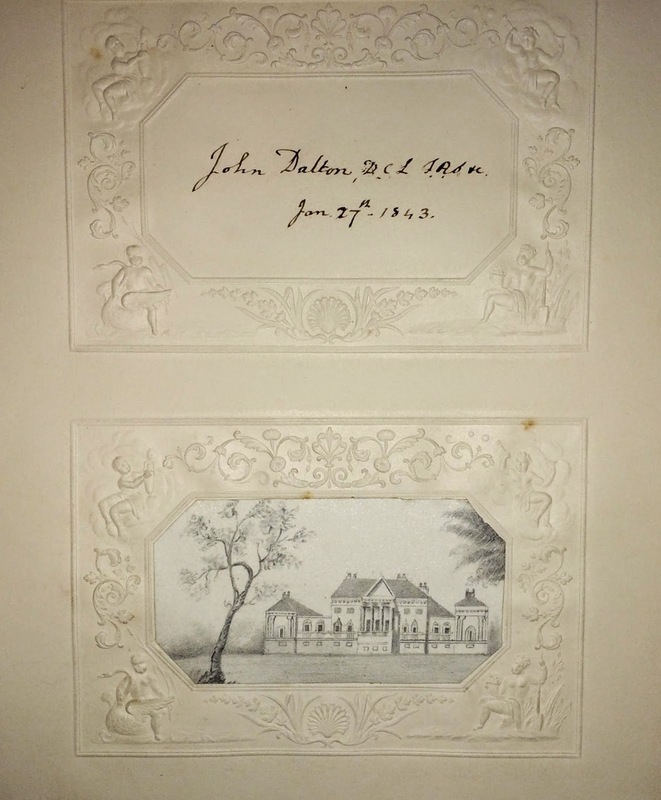 A few pages before the Dalton signature, the album contained a portrait sketched by architect J. J. Bateman of Leamington Spa (not shown), but it is signed, and the drawing of the building on Dalton’s page is not. 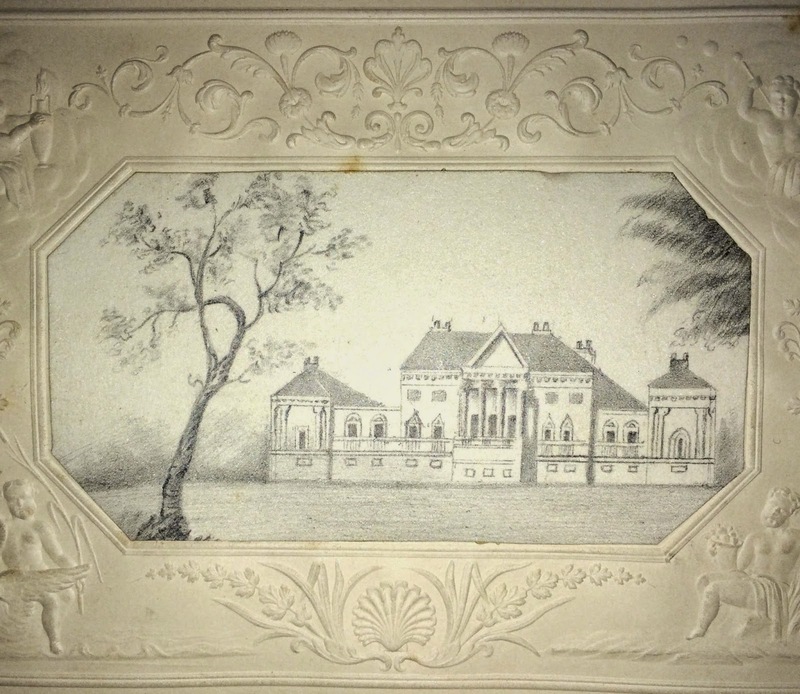 Who is the artist, was the building located in Manchester or Leamington Spa, and was it a home or did it have some other purpose? 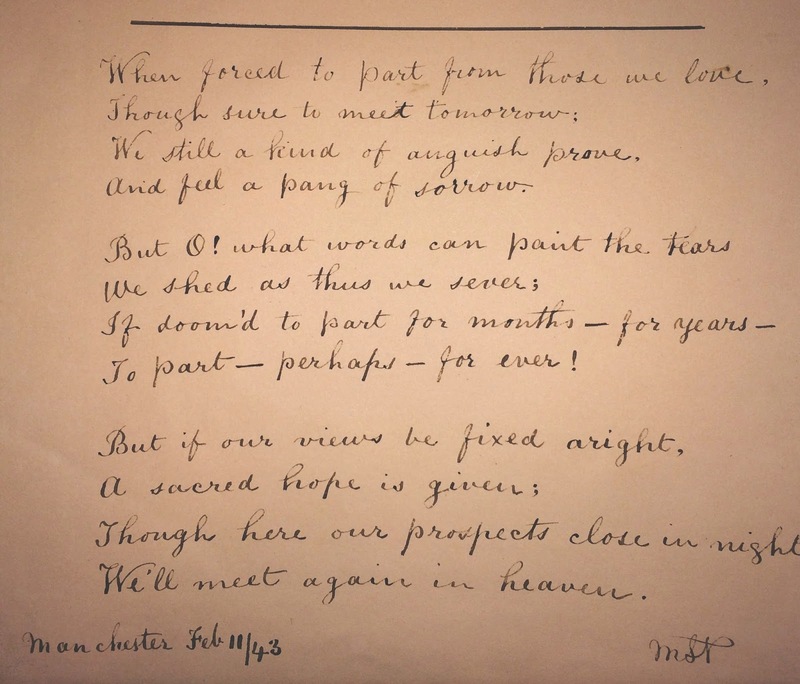 And what about the poem signed by the unidentified “MST” in Manchester on 11 February 1843 below the Peter Clare/Byrom signatures (Figure 7)? If there are any Mancurians, Leamingtons, or parties in the know who can shed some light on the sketch or signatures – post a comment and let me know! Copyright © M. I. Grossman. All rights reserved. It’s been quite a while since my last detailed post to the Meteorite Manuscripts blog, but for good reason — I took a rather circuitous route from researching meteorites to becoming engaged in the origin of John Dalton’s atomic theory. My road map, with all its twists and turns, is best addressed in a future post. 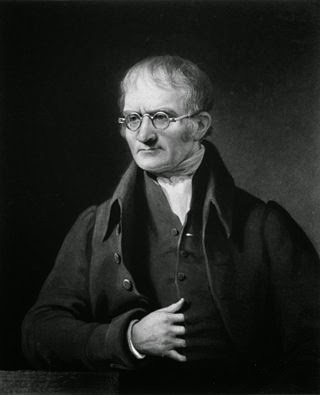 That being said, I am pleased to announce that a paper of mine on the subject now appears in the December 2014 issue of Notes & Records: The Royal Society Journal of the History of Science, and it raises new doubts about how John Dalton came up with his atomic theory. Specifically, the paper provides the first substantial evidence to challenge the conclusion, made by noted chemical historian J. R. Partington in 1939 and adopted by others who followed, that Dalton was not influenced by Irish chemist Bryan Higgins. Partington acknowledged that Dalton’s work developed concepts first introduced by Higgins, stating “Dalton’s theory is, therefore, not based on arbitrary rules but on the Newtonian atomic theory; it is an extension of that of Bryan Higgins and makes use of similar ideas...” But Partington ruled out the possibility of any influence, continuing “although there is no reason to think that Dalton was indebted to Higgins.” My paper does indeed provide evidence to suggest a “missing link” between Dalton and Bryan Higgins — it is William Allen —Dalton’s friend, fellow Quaker, and chemist. Dalton first described his atomic theory in his book A New System of Chemical Philosophy, published in 1808. His theory, based on principles such as the uniqueness of atoms of the same element, relative atomic masses, and the rules of chemical combination, comprise the tablets of modern chemistry, enabling present-day chemists to perform a myriad of practical calculations, without giving a second thought as to their origin. In spite of the magnitude of his accomplishment, how Dalton came up with his theory remains a mystery, which has been debated by historians for over 150 years. Although it is clear that his interests in meteorology, evidenced in his 1793 book Meteorological Observations and Essays, fueled his investigations, did his atomic theory arise from work on chemical combination or from investigation of solubility of gases in water? Amidst the debate regarding the origins, the possibility that Dalton was influenced by, or even aware of, the theories of Irish chemists Bryan and William Higgins, uncle and nephew, respectively, has been given little credence. “The new chemical doctrines I have lately promulgated have been much circulated on the continent in the Annales de Chimie, &c, & highly spoken by Berthollet, Pictet, &c. Mr. Wm. Henry here has declared his adoption of them, and I infer no opposition from any quarter. Every days experience convinces me of their stability. In the first paragraph of the letter, Dalton is referring to the French scientific journal that published his work on the law of partial pressures, steam, evaporation, and the expansion of gases, not his atomic theory based on rules of chemical combination or relative atomic masses. As indicated by the next paragraph in his letter, Dalton was “on to something” alright, but it had nothing to do with chemical combination or atomic masses — it was heat, and how it combined with matter. Throughout his life, Dalton believed in caloric, the supposed substance of heat at the time. On 10 July 1803, Dalton traveled to London to talk with Allen about his friend’s prospects for lecturing at the Royal Institution. Although the meeting between the two men occurred at a crucial moment in the narrative of the origin of the atomic theory, it has not been noticed or addressed by Dalton scholars. Dalton believed his new investigations on heat could be as important as the law of gravity, and he certainly would have discussed this with his friend Allen, just as he had mentioned it in the 12 April 1803 letter cited above. How could Allen remain silent when Dalton began to talk about “the nature of Heat & all its combinations with substances”, when one of the first, fundamental lectures described in the Minutes of the Society, was “Caloric, whose Parts are repellent of each other, combines with divers Bodies”? To me, it is difficult to believe that Dalton could possibly emerge from his meeting with Allen without learning something of Higgins’s theories. But why is Bryan Higgins’s theory of heat so important to the origin of Dalton’s atomic theory? According to Higgins, matter consisted of globular atoms surrounded by a repelling atmosphere of heat, and it was the balance of the repulsive and attractive forces between atoms that led to their combination, one atom to another, a process Higgins called “saturation.” Although Higgins’s examples of saturation dealt with binary combinations of atoms, in at least one instance in his Minutes of the Society, he did allude to combination of more than two particles to form ternary or higher compounds. One of the key foundations of Dalton’s atomic theory is his “rule of greatest simplicity,” a binary combination of atoms, similar to Bryan, but applied step-by-step to form ternary and compounds of higher order, which Dalton used to explain his law of multiple proportions. "It appears, too, that a very rapid mixture of equal parts com. air and nitrous gas, gives 112 or 120 residuum. Consequently that oxygen joins to nit. gas sometimes 1.7 to 1, and at other times 3.4 to 1." Several historians have suggested that Dalton was specifically looking for evidence of multiple proportions in his experimental data, and various reasons have been offered as to how he made such rapid progress in developing his chemical atomic theory. In light of the evidence provided in my paper, I believe that Dalton’s meeting with Allen, where he learned of Higgins’s theory of heat and chemical combination, provides the simplest and most logical explanation. Exactly how and to what extent Bryan Higgins’s theories might have influenced Dalton are questions certainly open to debate. But Dalton’s ideas did resemble Higgins’s in many respects, and I believe his meeting with Allen represents a "missing link" in the development of the atomic theory, a "Daltonian doubt" regarding Bryan Higgins, but one not as easily resolved as the “Daltonian doubts” floated by historians over the past 50 years for other scientists who might have influenced Dalton. For a more detailed discussion with references, see M. I. Grossman, “John Dalton and the London Atomists: William and Bryan Higgins, William Austin, and New Daltonian Doubts about the Origin of the Atomic Theory”, Notes & Records: The Royal Society Journal of the History of Science 68(4), 339-356 (2014), by searching for the article title at the journal hompage at http://rsnr.royalsocietypublishing.org/, or at http://rsnr.royalsocietypublishing.org/content/68/4/339.full.pdf+html. The paper also argues that Dalton should have been aware of William Higgins’s work before he came up with his first table of atomic weights, and briefly addresses the possible influence of British physician/chemist William Austin on Dalton’s thinking regarding relative atomic masses — topics that are beyond the scope of the current post. Scientific American has just opened its archives for the years 1845 to 1909 until the end of November. Details can be found at http://www.nature.com/scientificamerican/archive/index.html. The archives is very useful for the meteorite historian - articles and letters relating to meteorites, meteors, aerolites, etc., can be downloaded for free until November 30. To use the resource efficiently, click on the link "Advanced Search" in the upper right-hand corner of the web page, which will bring you to the following search page: http://www.nature.com/sciam/search/adv_search?sp-a=sp1001702d&sp-x-1=ujournal&sp-q-1=Scientific American. Enter your search word at the top, for example the word "meteorites", and then scroll down to the bottom of the page, and select sort by "Date - Oldest". I pulled up 810 hits for this search, and if the articles are between 1845 and 1909, you can just click on the title and download the article for free. The first item on my retrieval list was entitled "Meteorites - Their Origins", which was published on page 94 of the December 9, 1848 issue of Scientific American and discusses Charles Upham Shepard's views on meteoritic origins. I haven't done much searching on the archives yet, but I am sure it will turn up some really nice items for those interested in the history of meteorites. Happy searching! Weston Revisted: Scholarly Reviews of "A professor, a president and a meteor"
Back in January 2011, I posted a review of Cathryn Prince's book, A professor, a president and a meteor. Up until recently, there have been few, if any, scholarly reviews of the work. The situation has changed with the publication, or upcoming publication, of three new reviews. Ursula B. Marvin, Harvard-Smithsonian Center for Astrophysics, has written a detailed nine page review with references which is well worth the read. It appears in the current issue of Meteoritics & Planetary Science 46, Nr 10, 1608-1616 (2011). For those who are not members of the Meteoritical Society and who do not receive the journal, the article can be previewed and purchased at http://onlinelibrary.wiley.com/doi/10.1111/j.1945-5100.2011.01242.x/abstract. I found Marvin's discussion of Nathaniel Bowditch's study on the Weston meteor and his relationship with President Jefferson to be particularly insightful in responding to Prince's comment that Jefferson asked Bowditch to "dispute Silliman's work on the Weston Fall." As Marvin points out, Prince's comment is found on page 234 of the index to book, but the theme runs through the text. Kristine C. Harper, Florida State University, has written a short two page book review, which offers some some interesting comments disputing Prince's references to the work of Johannes Kepler. The review appears in the journal History: Reviews of New Books, 39:4, 112-113 (2011). The article can be previewed and purchased at http://www.tandfonline.com/doi/abs/10.1080/03612759.2011.598105. And lastly, I was honored to be invited to submit a shortened version of my Meteorite Manuscripts book review to Ambix, the scholarly journal of Society for the History of Alchemy and Chemistry, which should appear in the November issue. More information on Ambix can be obtained at http://www.ambix.org/index.php?option=com_content&view=article&id=18&Itemid=18. 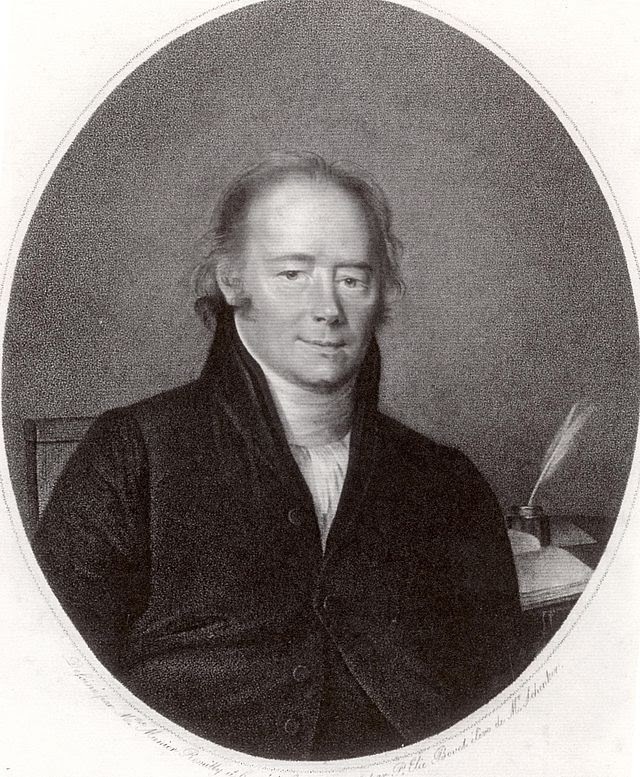 As I mentioned in my first review, contrary to Prince, Silliman was not the first American scientist to have his work published in the French journal Annales de Chimie. Robert Hare, his associate, had his paper on the oxygen-hydrogen blowpipe published in the journal five years before the Weston meteorite fall, and he received an international reputation as a result of his work. 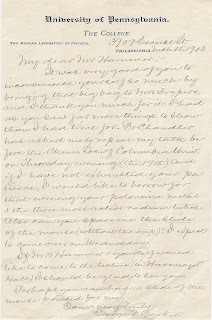 In her review, Marvin does not emphasize the importance of this point, initially stating that Silliman's report "was the first scientific paper in America (since Benjamin Franklin’s time) to win the admiration of the learned societies of Europe", but a few paragraphs later describing Hare as "a chemist who had gained international fame in 1801 as the inventor of the oxyhydrogen blowpipe." In my opinion, all three reviews reach a consensus that Prince has overstated Silliman's contributions in the field of meteoritics. An earlier biographer of Silliman, Chandros Michael Brown, had no such misconceptions about Silliman's accomplishments, stating at the beginning of his work, “but the bald truth is that Silliman’s contributions to science, as such, were negligible.” Although Prince used Brown's work as a reference, this fundamental perspective on the scientists life was completely ignored (see C. M. Brown, Benjamin Silliman. A Life in the Young Republic. Princeton, 1989, xiv). Prince is a well-intentioned author who is on firmer ground when discussing Silliman's real, long-lasting accomplishments. Silliman established the American Journal of Science and a school of chemistry at Yale, and he was an educator and promoter of science in the young American nation. In the end, there is indeed a very real difference between capturing the imagination of the public and making fundamental scientific discoveries. The Royal Society has announced that it is providing free access to all its journals 70 years or older. This is of special interest to all historians conducting research on meteorites, since all of the material in the Philosophical Transactions of the Royal Society, first published in 1665, is available. Refer to the press release at http://royalsociety.org/news/Royal-Society-journal-archive-made-permanently-free-to-access/ for more information and for a link to begin a search of the journals. Another source of historical information available from the Royal Society is its history of science journal, Notes & Records of the Royal Society. Content is normally restricted for one year, but after that period, the articles are freely accessible. I was fortunate enough to have an article dealing with the Mooresfort meteorite published in December 2010. Since it was the 7th most-downloaded article for the year, it is freely accessible even though a year has not passed. If you have not obtained a free copy, go to http://rsnr.royalsocietypublishing.org/site/misc/top_ten.xhtml and scroll down to the link which reads "William Higgins at the Dublin Society, 1810–20: the loss of a professorship and a claim to the atomic theory", by Mark I. Grossman. Click on the link and you can download a pdf copy without charge. Another article of mine entitled "Smithson Tennant: meteorites and the final trip to France" can be downloaded for free at http://rsnr.royalsocietypublishing.org/content/61/3/265.full.pdf+html?sid=6aa58f86-22ea-4aef-a597-1aa6f9da545e. 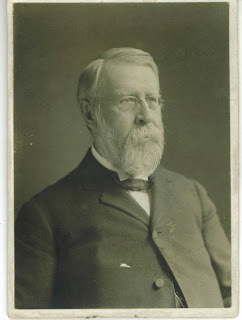 Chemist and physicist George Frederick Barker (1835-1910) was instrumental in introducing radium to the US, and gave an important lecture entitled “Radio-Activity in Chemistry” at Columbia University on March 19, 1903 [Columbia School of Mines Quarterly, 24, 267-302 (1903)]. For more information on Barker's life, see Edgar Fahs Smith National Academy of Sciences memoir (NAS Biographical Memoirs, 62). You can download a copy by going to the NAS Biographical Memoirs webpage and searching the online collection for Barker. Figures 1 and 2 display the front and back on an old cabinet photo of Barker that is in my collection. Click on each photo to enlarge; click again to enlarge further. In his talk, Barker showed three vials of radium salts, as well as a radiograph of a mouse, all of which he obtained from W. J. Hammer (1859-1934), author of the 1903 book, Radium and other radioactive substances. Two radiographs of a mouse (one on a plate and the other caught in a trap) are shown in Hammer’s book (pages 38-39), but only one was used by Barker in his Columbia lecture (p. 290). Hammer worked for Thomas Edison, was an early experimenter with radium having obtained samples from Pierre and Marie Curie in 1902, and developed the infamous radium paint used on watch dials. “Dr. Chandler has asked me to repeat my talk before the Chem. Soc. of Columbia Univ. on Thursday evening (the 19th)… I would like to borrow for that evening your polonium metal & the three most active radium tubes. Also, can you spare me the slide of the mouse (without the trap)? Never mind the radiation concerns. Seems like Barker did not want to disturb his audience with pictures of any dead mice caught in traps! 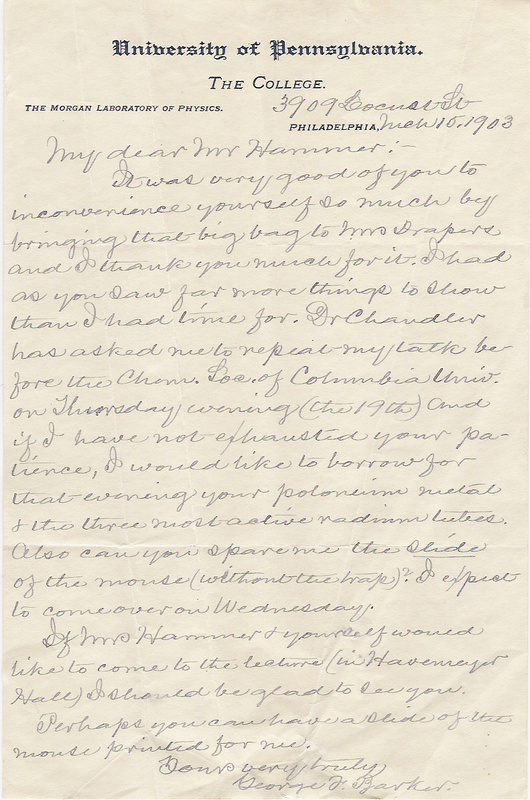 I am particularly fond of this letter because it not only mentions the radiographs that can be viewed in Hammer's book and Barker's lecture, it references Columbia chemist Charles Frederick Chandler (1836-1925) and the behind-the-scenes preparation for Barker's talk. 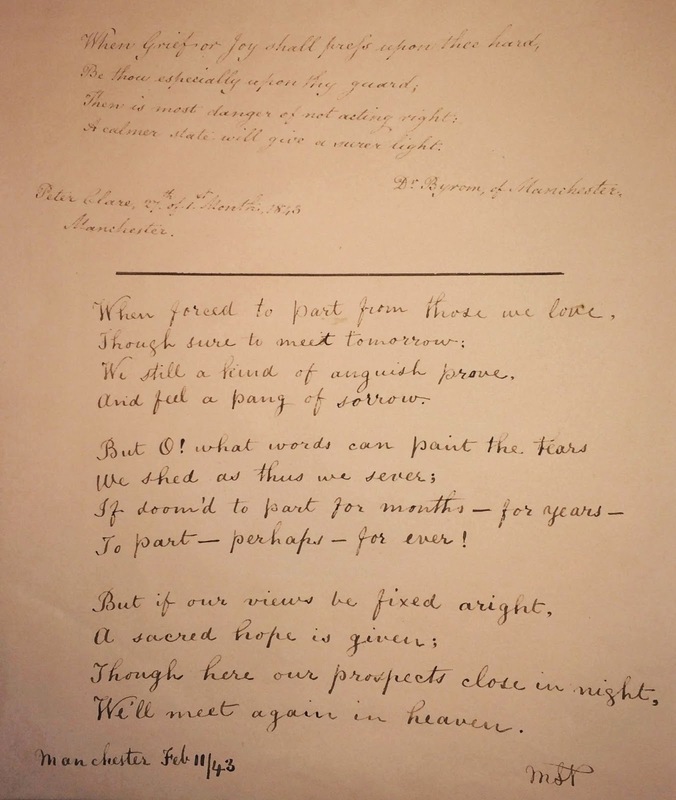 Meteorite Manuscripts is a blog which was established to display and discuss scientific autographs and books, particularly those that deal with meteorites and the history of science. Part of the fun of collecting autographs is, of course, sharing the experience with others. Mark Grossman holds a Masters degree in Chemistry from the University of Wisconsin-Madision and a second MS in Environmental Health Science from the Hunter College School of Health Sciences in NYC, as well as a BS in Chemistry from Lehman College (CUNY). He is a Certified Industrial Hygienist and Certified Safety Professional. His spare time is spent as an independent researcher and writer, and his papers and reviews have appeared in Notes & Records of the Royal Society, Ambix, and Meteorite.